Jake T Austin and Anna Sophia Robb team up for Khumba. Jake T Austin, Anna Sophia Robb and Liam Neeson provide the voices for the main characters of a new animated movie about being different! When Khumba(Austin), a half-striped zebra is blamed for the lack of rain by the rest of his insular, superstitious herd, he embarks on a daring quest to earn his stripes. 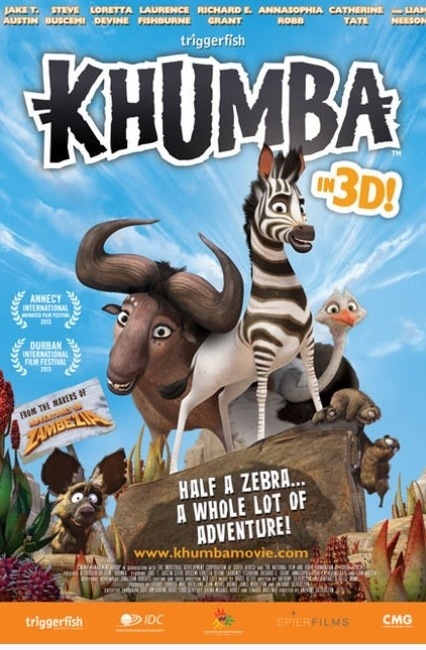 In his search for the legendary waterhole in which the first zebras got their stripes, Khumba meets a quirky range of characters, and teams up with an unlikely duo: an overprotective wildebeest, Mama V, and Bradley, a self-obsessed, flamboyant ostrich. But before he can reunite with his herd, Khumba will have to come face to face with Phango, a sadistic leopard who controls the waterholes and terrorizes all the animals in the Great Karoo. It’s not all black and white in this colorful adventure with a difference! This isn’t Jake’s first animated project. He voiced both Diego in Go, Diego, Go and Fernando in Rio.